The Grapevine is a community-driven arts and culture publisher serving the Annapolis Valley. Through traditional print and online space, we aim to connect our readers with the stories, event listings, and community news to help build and support our local thriving culture. The Grapevine is printed every second Thursday with the help from a supportive network of team members and community contributors. The creator of The Grapevine, Adam Barnett, started publishing an 8-page paper in 2004. It was his dream to bring attention to all the amazing cultural happenings in the Greater Wolfville area. In 2007, Andy Flinn & Ariana Nasr took the reins. The dynamic duo put their stamp on things by increasing the scope and perspective of the local music scene. Jocelyn Hatt and Jeremy Novak took on the trusted, counter-top publication in 2009 and they stayed true to its initial focus. They brought the paper to newsprint, and released regular 16-28 page issues that covered the thriving arts and entertainment scene from Windsor to Berwick. In 2016, The Grapevine was incorporated, bringing it into a new era of community publishing! The 16-24 page paper is hand-delivered to over 800 locations between Windsor and Middleton. 5,000 issues are printed bi-weekly, with a readership of approximately 14,000. Currently, The Grapevine is owned by four working mothers – Genevieve Allen Hearn (Operations), Emily Leeson (Editor), Jocelyn Hatt (Design), and Monica Jorgensen (Listings). 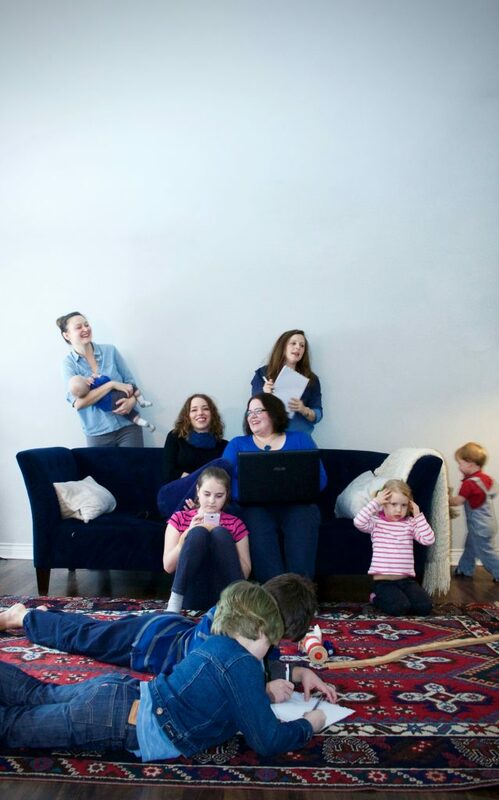 Issue meetings usually involve a kiddo or two (or three… or four…).